Ganesh is the Hindu elephant-headed God and is known as the Remover of Obstacles, the god of domestic harmony and of success. He is the most beloved and revered of all the Hindu gods, and is always invoked first in any Hindu ceremony or festival. He is the son of Parvati (the wife of Shiva, the Destroyer, the most powerful of the Hindu trinity of principal gods). 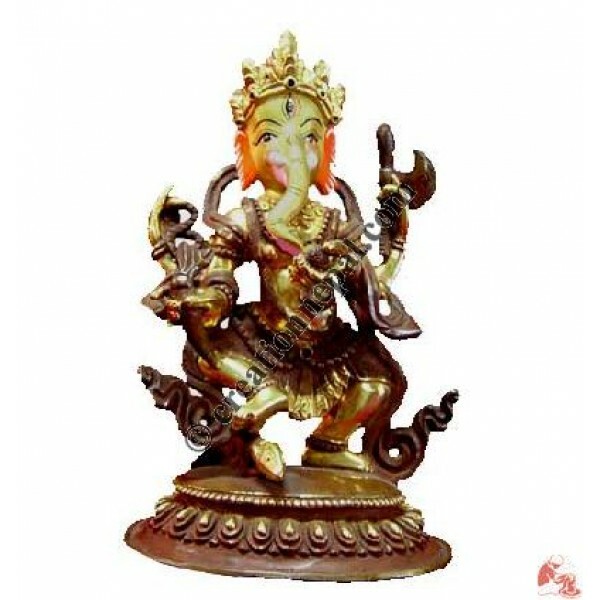 The statue is made by the Nepalese craftsmen using traditional method of craftsmanship by hand. The materials used is cupper and later on, it is partly decorated by gold and some other colors. Since the product is handmade, there can be slight variation in size and weight.